A collaborative project with Naturalist, Katie Finch. Rebel Nature Journal is not your typical journal. In this journal your experiences in the natural world are not always recorded in pen, full sentences, or even words. You capture your adventures in mud, rain, squished berries and dead bugs. The activities are intended to spark creativity while offering a fresh perspective of the world. We hope it develops a gratefulness for all the world has to offer - large or small, beautiful or ugly, familiar or unfamiliar. 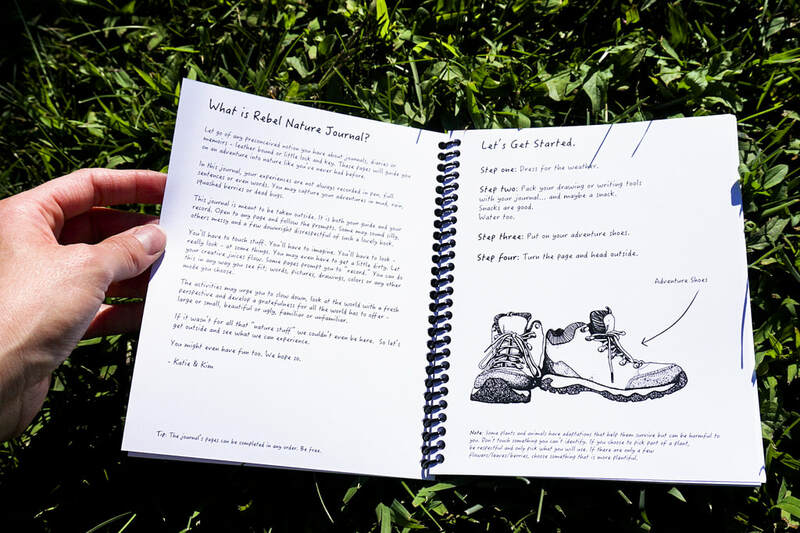 This book was made in association with Audubon Community Nature Center with the help of the United Arts Appeal of Chautauqua County Projects Pool Grants Program. RNJ encourages you to take a break from the daily grind and reconnect with your roots in nature. RNJ is not just for children. Written and geared to all ages, RNJ can be enjoyed by any nature lover. Audubon Community Nature Center used RNJ as inspiration for one of their Day Camps.